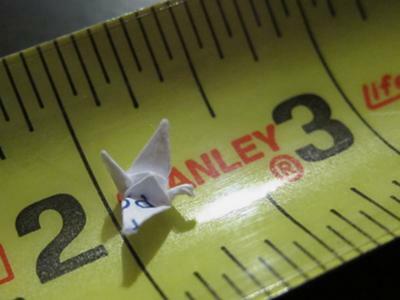 My origami crane is very small! It's made from ordinary paper from a free notepad (approx. #18), but I had to use tweezers to fold it. Wow… I don’t exactly know what to say here. I know the hardship that I have took to make a regular crane. And I wonder how you managed to make a crane that is so tiny. How did you make the folding so perfectly? I am content to find your memorable way of code the position. buy coursework essays. Now you create it easy for me to be appreciative for and place into put into practice. I am content to find your illustrious way of symbols the post. websites that write essays Now you generate it easy for me to appreciate and put into practice. www.customessaysonline.org -perfect and cheap essays for you. BuyEssaysOnlineFast to know more about what we do! Such a great origami, really like it! Maybe you need help in essay writing? Students often feel very stressed during their studying in college. someone to write my paper Hopefully, there are special services which are aimed to make college life easier and help in preparing excellent essays. Post very nicely written, and it contains useful facts. I am happy to find your distinguished way of writing the post. write-my-essay4me.com Now you make it easy for me to understand and implement. Papers written by the majority of online companies are real rubbish. I was tricked by some of them for several times. There are not that much trustworthy websites. Thank God I found essay write company. Their writing is fast and quality. Prices are ok.
i love it! i think it is so cool! i love doing origami and i am working on making 1000 cranes! that is really small and those people who said "ive made bigger" ID like to see you try! Dude How Long Did It Take To Make That!!!!!!! Sorry but Cranes and elephant has made a MUCH smaller one than you! That is a great crane. And I love how you photographed it on the measuring tape! I'm teaching the crane to a group at the library where I work, and I'm going to show them this. Sorry. but I have made an even smaller crane! I will try to post it. wow! i think it is amazing how it is smaller than a centimeter! i am not very good at origami myself and it is a new experience so i am sure i could follow your example! I can't believe that you had to use tweezers to fold it!! And its so small that i think if i walked away it would be almost microscopic!!! Bravo! Your crane is folded so beautifully, and I admire your photographic presentation.